As a Marwin Gonzalez owner, I’ve considered writing about him several times over the season’s first two months. I took a $1 flier on him in a 4×4 ottoneu Classic league this offseason, and at the time my expectations could be roughly summarized as “There’s worse ways to fill out a roster.” In most fantasy formats, Marwin qualifies at every position except pitcher and catcher, and he was coming off a season that saw him produce 25 HR+SB. Like I said, there’s worse ways to spend a dollar on a bench player. Every time I’ve thought previously about writing up Marwin this year, I got hung up on the fact that I had absolutely no idea if his breakout was for real, or if it was just a fluky hot start. Actually, if I’m being completely honest, the whole reason I decided to write this piece you’re currently reading is because I still don’t know. In the following paragraphs, I invite you to join me as I take a stab at figuring out Marwin Gonzalez. In case you aren’t already aware, let’s get one thing out of the way first: Marwin Gonzalez is raking. He falls just short of qualifying for the major-league leaderboards, but if you dial back the playing time requirements a bit, Marwin finds himself in some elite company. Among all major-league hitters with at least 130 PA, he’s No. 6 in wRC+, No. 7 in ISO, No. 8 in SLG, No. 17 in OBP…basically, if it’s an offensive category, he’s probably doing really well in it. Rather conveniently for the sake of this discussion, Marwin’s a very similar hitter from the right and left sides of the plate. He’s always had a touch more power against lefties, but nothing extreme at all. It’s actually kind of weird to see a switch hitter with career numbers so similar from both sides. So, what’s he doing this year? You see why I’m so intrigued? Where did these numbers come from? It’s not just the power either; he’s increased his walk rate against righties by about 250%, and his walk rate against lefties has nearly tripled. These are both still small samples, but when it’s nearly June and you’re still hitting in the neighborhood of .300/.400/.600, you officially have my attention. Not to give away too much regarding my research methods, but I decided to visit the Google.com website, where I entered the words “marwin gonzalez adjustments” and clicked the Google Search button. The results were surprisingly barren. All I could find is an ESPN article which asks in the headline if Marwin is “Real or not?” but doesn’t attempt to provide an answer, and an SB Nation post which mentions Geoff Blum commenting on an Astros broadcast about Marwin dropping his hands at the plate this year. It’s likely that the first difference you noted was that the Astros moved their center-field camera this year, and you’d be right about that. 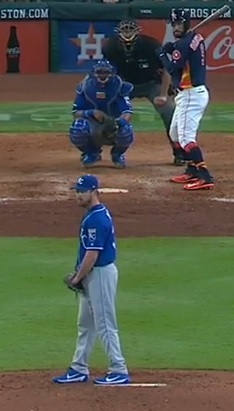 As for Marwin, he’s clearly starting his hands significantly lower from this side. Whereas last season his hands started up around his chin, he’s now got them right at the letters. He also switched from last year’s wide-open stance to a more closed off approach. 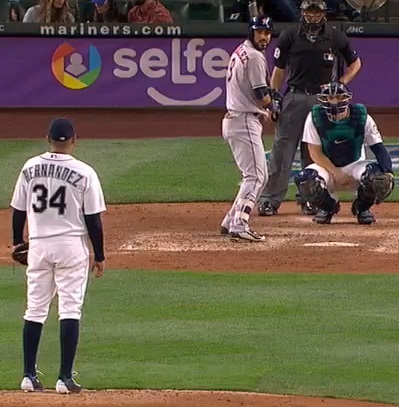 I don’t think there’s even a chance Marwin hits that pitch into the seats using his old approach. 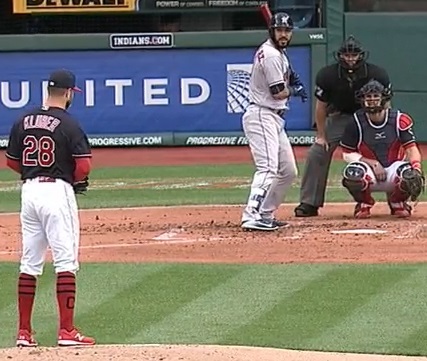 With a stance that open, and hands that high, he wasn’t going to take a pitch on the low outside corner over the wall in right-center. 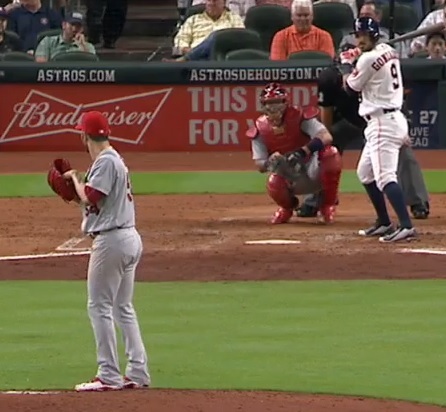 As a lefty hitter, Marwin’s opened up his previously closed-off stance. Also, he now stands up straighter, instead of slouching his shoulders and clutching his bat handle against his belly button. In the simplest of terms, he just looks so much more comfortable from the left side now. Still, even all these adjustments probably aren’t enough to make Marwin a legit .300/.400/.600 hitter. He’s gotten lucky in the home-run department so far this season, as his average home-run distance is just 380 feet, one of the lowest marks in the league. He also has a soft-hit rate that’s north of 20%, which also suggests some regression. In short, he’s not going to keep up this level of power production. What I’m seeing here in general is a classic example of the eye test backing up the numbers. There are easy-to-spot adjustments to Marwin’s approach from both sides of the plate, and while his results are still a bit fluky — at least as far as homers are concerned — they aren’t entirely unsupported either. It’s also important to remember that Marwin just turned 28 in March. While he’s still on the late side for a breakout, he’s not exactly old either. Final verdict? I think Marwin is mostly legit. He’s not the .300 AVG, 40 HR guy he’s on pace for, but .280 with 25 bombs doesn’t sound unreasonable to me. We hoped you liked reading The Mostly Legit Marwin Gonzalez by Scott Strandberg! I have Marwin for a dollar too in my beginner FGPTS league. He is my 5th best offensive performer in points and he is 9th is games played. I picked him up early because he can play everywhere and I had a big case of 10 day disabled list blues. The only $1 player I have that has scored more points is Scott Schebler who has played 3 more games. I know that neither player will probably continue at their current pace but it does help a little when my high priced so called studs are hurt or struggling.